58" x 56" x 57"h., 4.5 lbs. Measuring in at a compact 58" x 56" when set up, the Ameristep® Gunner Ground Blind makes it quick and easy to create a hunting headquarters almost anywhere. 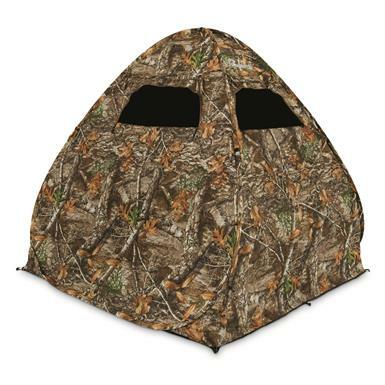 Lightweight Ground Blind is made from weather-resistant Durashell Plus fabric and features a shadowguard interior that eliminates shadows and conceals your scent. Footprint Dimensions: 58" x 56"